Couch to 5K is an app that can be downloaded to guide you through beginning to run. It is really more of a running plan, the app just supports the running plan. This website shows a breakdown of the running plan, if you scroll almost to the bottom: CLICK HERE. 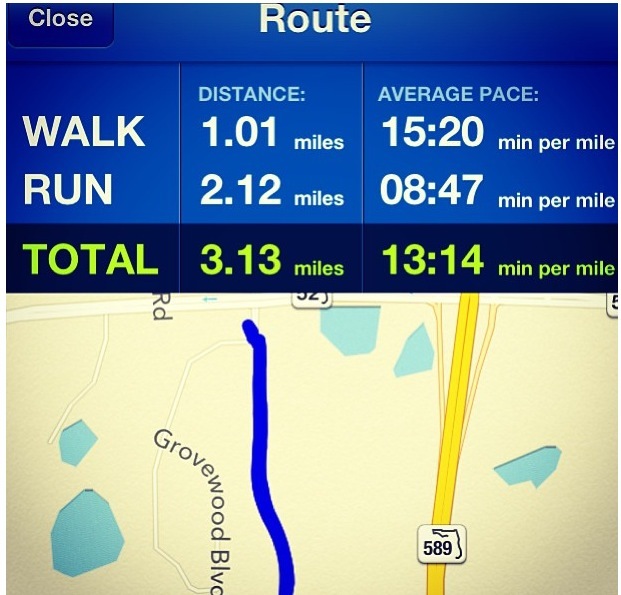 When I started running I utilized this app. It was great to start! There is a coach that tells you when to run and walk and even has some encouragement built in. There are a few different coaches, so you can decide if you want a female or male, sweet or harsh. Because I never considered myself a runner, it was nice to ease into running with the intervals. The first week it alternated 60-seconds running and 90-seconds of walking. I will be honest – the first day or two I thought I would be better if I just quit. But by the end of the week, I found myself hearing the end of the running interval in my ear buds before I expected to! It gave me confidence to start the next week. I didn’t finish the whole Couch to 5K program because I was discouraged by the incorrect pacing. I initially switched to RunKeeper, before David bought me a Nike Plus watch. Pros: Ease into running. Breakdown of running pace versus walking pace (see photo). Coaches within app. My only gripe: my pace on the Couch to 5K app was always around 8-9 minutes per mile. This is way off! I was about a 12-13 minute mile when I got to a new, more reliable app and running watch! Reviews on those apps and products coming soon! Cons: No accumulated distance report. I love seeing my mileage total on Nike! Would I recommend it? Yes, for those that want a place to start with running. If you don’t consider yourself a runner or can’t run for long distances, this app is a great place to start! Love this review! Today was one of those days where I wondered if I really needed the app b/c I didn’t feel it was correct. Now that I know I am not the only one I will stick with it and HOPEFULLY be 5k ready in Aug.